Washington Gov. Jay Inslee may have finally found his place in life, at the tail end of a race for the Democratic presidential nomination, garnering a big ‘0’ in the opinion polls while still capable of raising $2.25 million in grassroots campaign contributions, 75 percent of which were, according to MyNorthwest.com, “$25 or below. That wouldn’t even buy a half-tank of gasoline for most cars in the Evergreen State, considering how much gas costs in the Seattle area. 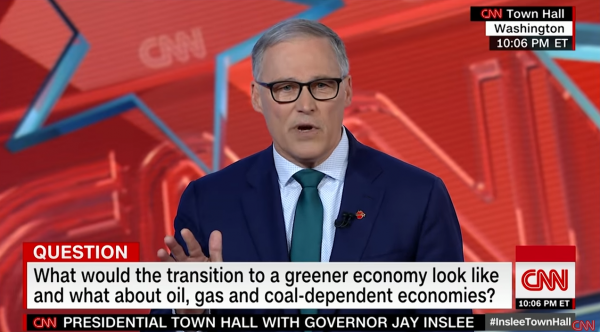 With his reported campaign revenues, Inslee has met one of the criteria for being included in Democratic National Committee debates, the news forum reported. A candidate needs 200 donors in 20 different states, as noted by The Hill. Aside from being a “Zero” candidate, he has name familiarity problems and his decision to run as a “climate change” candidate puts him in a tight corner. Most voters, whether liberal or conservative, understand that their personal budgets revolve around the price of a gallon of gas, and Inslee seems rather fond of hiking fuel taxes. The liberal governor—Washington has not had a Republican in the governor’s office in more than three decades, and the expansion of state government underscores that—is also known as an anti-gunner. While in Congress, he earned poor ratings from gun rights groups, and as governor he has been no friend of the Second Amendment. He supported gun control Initiative 1639 last year. KIRO Radio personality Dori Monson has started an effort to find Inslee a campaign song. So far, suggestions from listeners include “Taxman” by the Beatles, “Bein’ Green” by Jim Henson for Kermit the Frog, and “What a Fool Believes,” by the Doobie Brothers. Ninety-five percent of his donations are $100 or less, which doesn’t say much for his ability to raise the big bucks necessary to win a primary campaign against the likes of Bernie Sanders, Robert Francis “Beto” O’Rourke, Kamala Harris, rising star Pete Buttegieg or Joe Biden, who isn’t even officially in the race, yet. Another Inslee disadvantage is that he’s from Washington state, which doesn’t get a lot of traction with the national press. They virtually ignored the late Sen. Henry M. “Scoop” Jackson when he ran for president in 1972 and 1976, even when he won both the Massachusetts and New York primaries in the latter primary race. The national press focused on Jimmy Carter rather than Jackson, a “cold-war Democrat” who was also anti-Communist, which didn’t earn him any favor with the liberal wing of the party. In today’s political environment, it’s doubtful Jackson could even be elected to the Senate in Washington. Inslee, on the other hand, seems to fit better with the far left. However, the national press corps seems to have its sights set on Sanders, Biden, O’Rourke and Buttegieg, at least for the moment. That leaves Inslee in competition with Kirsten Gillebrand, Wayne Messam, John Hickenlooper and Marianne Williamson for the “Rodney Dangerfield” award. In a recent Emerson poll, they all hit rock bottom at 0 percent, trailing even “Someone Else,” which drew 2 percent support from poll respondents.